December is the time to bring out the fancy Christmas china, polish the silver pitchers, and . . . bedeck your best bromeliads. In 2017, as in 1700, no proper hostess can be without a pineapple for her centerpiece. Here we unpack the botany of pineapple, which is as complicated and fabulous as its cultural history. A proper hostess, after all, should also be able to dazzle her guests with tales of tropical fruit morphology. 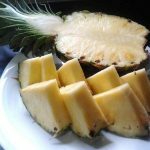 The main blog for today is hosted at the Botanist in the Kitchen Blog and is a wonderful tour through the botany of a pineapple, it’s infructescence and how to make a pineapple based table decoration (Did the authors watch Blue Peter in their youth? Both authors assure me Blue Peter did not cross the Atlantic – what a shame!). For the full and strange story of #AdventBotany2017 pineapple read the BitK Blog Here. We’ve been growing pineapples in the glasshouses at Reading University ever since the refit of our tropical glasshouse in 2011/12. We generally have six or seven plants growing and there is a pineapple in flower or fruit from late spring until mid winter. The plants tend to slow down in the short days of December and January. They need rich soil to grow well and we top dress the greenhouse soil each year with a layer of horse manure which rots down and feeds the plants. For a personal view on the diverse bromeliad family read the blog by Eduardo Fernandez here. This entry was posted in Advent, Herbarium RNG, Public Engagement with Science and tagged #AdventBotany, #AdventBotany2017, Botanist in the Kitchen, Jeanne Osnas, Katherine Preston. Bookmark the permalink.